The Report Join WSRA for our 36th Annual Conference & Trade Show Anne Piacentino, Events & Communications Coordinator, WSRA, apiacentino@wsra.net WSRA’s annual conference and trade show is always a prime opportunity to connect with colleagues, clients, and friends in one place. The strong agenda delves into many pivotal issues facing our industry, and this year’s conference also boasts more breakout sessions, workshops, and networking opportunities than in previous years. I’m really looking forward to seeing all of you at the Wenatchee Convention Center, May 15-18 in Wenatchee! To Recycling and Beyond This year’s theme is To Recycling and Beyond, and we are thrilled to welcome a unique keynote address for this year’s conference that will bring fresh perspectives and knowledge to attendees. Kicking off the conference, our opening Keynote will be from the Bridgeworks organization who describe themselves as The Generation People. Hannah Ubl, one of Bridgeworks’ principal speakers dive into the background of why different generations make the decisions and have the work styles they do as well as getting tools to work across those generations effectively. Skills can be put to use instantly and applied throughout the conference and beyond! Meet Your Exhibitors Back by popular demand, immediately following the opening keynote address on Monday morning, conference attendees will have a unique opportunity to meet our 2016 exhibitors in a fun, relaxed format: Vendor Speed Networking! This session is designed in a speed dating format to help you match a face with a name or company, participate in genuine dialogue, and have some fun! This truly is a networking opportunity rather than a time to present and promote specific products or services. Come with your smile on, but your collateral off! issues, meet new people, and catch up with old friends. Since my first Conference in 2007, I can probably credit most of the professional connections I have made in that time to the WSRA Conference or other WSRA function. This is the place where the industry truly converges. I look forward to seeing you in Wenatchee! 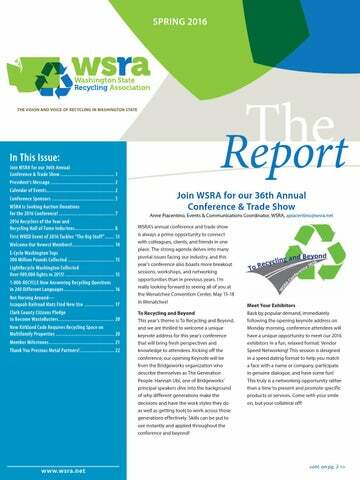 The Report >> Join WSRA for our 36th Annual Conference & Trade Show (continued from page 1) A Conference Tailored to Your Needs There are certainly issues which unite all of us in the industry, but at the end of the day each of us plays a distinct role in supporting and improving Washington’s resource management system. So, in addition to the plenary sessions that bring everyone together, we have organized a plethora of other educational offerings into four breakout session tracks, all of which are designed to cut across business sectors and geographic regions. Our goal is to help you get exactly what you need from the conference to support your daily work. Track: Education & Outreach Innovation, public outreach and Sessions include: education, and collaboration will continue •	Going Beyond Bags with WRAP (Monday AM) to be essential as we tackle the challenges •	Multi-Family Valet Recycling: of Washington’s recycling industry. The It’s in the Bag (Monday PM) effectiveness of any recycling program •	The Path to Progress—Recycling hinges on understanding human behavior, Hard to Recycle Materials and in many cases, asking individuals (Tuesday AM) to change their behaviors. How can we •	Recycling Corps—Behavior Change on a Large Scale provide engaging messages that get our (Tuesday PM) communities involved and interested in recycling and reducing their waste? This track will share research results, best practices, tips and tools to help educators inspire behavior change and enable our recycling programs to thrive in a variety of settings, communities, and institutions. Track: Markets These sessions will explore the latest issues, news, innovations, and forecasts for Washington’s recycling markets in 2016 and beyond. New this year, the Markets Track will feature a full-day, Commingled Curbside Markets Series on Tuesday, looking at the global and local status of recycling markets! The purpose of this series of sessions is to bring everyone up to speed on the current international and local market trends for materials that are collected from curbside recycling programs in our region. This session will appeal to new recycling professionals as well as the seasoned solid waste management professionals, local and state governments, consultants, equipment vendors and processors alike! Track: Operations As a variety of products are added to recycling bins and communities across the state seek to improve diversion rates, recycling businesses are facing greater challenges to collect, process and transport materials. What does it take to process materials in today’s recycling landscape? How can we increase recycling and reduce contamination through recycling collection logistics? This track will address the current challenges in recycling operations and infrastructure, and innovative solutions for a sustainable and profitable business. Track: Policy State and local government agencies play an important role in making the recycling process a success. These sessions will focus on successes and challenges of the latest legislation, programs and strategies on local, state, and national levels. General Sessions You Won’t Want to Miss! On Tuesday morning we will hear from our outstanding 2016 Recycler of the Year Award recipients to discuss their accomplishments and challenges as they work toward zero waste, and later in the day we will learn about the current state of the compost system in the state of Washington hearing from experts spanning the diversity of the composting industry. Closing the festivities on Wednesday morning will be Yoram Bauman, PhD, the world’s first and only stand-up economist. He performs regularly at colleges and corporate events and will bring his knowledge and humor to the recycling industry to send us back to our workplaces energized and enlightened! >> Join WSRA for our 36th Annual Conference & Trade Show (continued from page 3) Monday Facility Tours WSRA 2016 will take in the best of Wenatchee! Interactive tours of Wenatchee area keystone, Stemilt will offer two tours, one of their world famous composting operation and one of their state of the art apple packing plant. Both tours will feature the history and operating marvels of Stemilt’s operation which is vital to the economy of the Wenatchee Valley as well as the state of Washington. Networking, Auctions & More WSRA’s committees have been working long and hard to make sure that you learn something new, meet someone new, and participate in an activity that is new to you. View the conference schedule and agenda on our website and prepare yourself for the great events we have planned for you! Highlights Include: Sunday •	Weapons of Grass Destruction—WSRA’s Annual Golf Scramble •	Poker Walk through Downtown Wenatchee •	First-Time Attendees Networking Hour •	Welcome Dinner & Reception at Pybus Market catered by South Monday •	Silent Auction Soiree and Reception among our Exhibitors. Preview our auction items. Hotel Reservations Book your hotel today! Two great lodging options for accommodations in Wenatchee! Book at the Coast Wenatchee Center Hotel (connected via sky bridge to the Convention Center) for $109 per night or at the Red Lion Wenatchee for $89 per night. Go to our Venue and Hotel page on www.wsra.net for more information and booking links. Tuesday •	Pre-Banquet Reception with the WSRA Wine Pull •	WSRA 2016 Gala Awards Banquet honoring our Recyclers of the Year and Recycling Hall of Fame •	Live Auction. Preview our auction items. •	Paddle raise to support The Recycling Foundation! WSRA’s 36th Annual Conference brings together our diverse membership of recycling professionals from across the state and beyond to learn, network and problem-solve recycling challenges together. We can’t wait to see you at the Wenatchee Convention Center, May 15-18, 2016! Submit an article to the next issue! Share your company’s news, achievements, upcoming events, personal life updates and more with other WSRA members by submitting an article for the next issue of The Report! This is a great opportunity to inform and inspire other WSRA members by showcasing your or your company’s recent news. To submit an article, simply follow the Article Guidelines. *FREE for Silver and Bronze precious metal members *FREE for Gold, Platinum and Titanium members you match a face with a name or company, participate in genuine dialogue, and have some fun! This truly is a networking opportunity rather than a time to present and promote specific products or services. You will also be entered into a VIP raffle drawing and receive a thumb drive with contact information for all participating recycling professionals and vendors. Come with your smile on, but your collateral off! E-mail your completed article and separate photos to recycle@wsra.net. We look forward to sharing your news with other recyclers! Advertise in The Report Your advertisement will reach more than 700 subscribers with a wide range of environmental interests. Precious metal members receive free advertising as part of their sponsorship. 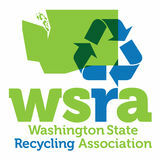 For more information: recycle@wsra.net or (206) 244-0311. WSRA is Seeking Auction Donations for the 2016 Conference! WHY DONATE Donating to our auctions and the Wine Pull is a creative way to show your support for the recycling industry, and you will be recognized at the conference for your generous contribution. 100% of auction proceeds go directly to advancing recycling in Washington, and enhancing the knowledge, skills, and careers of recycling professionals. Your donation can give a second life to items you no longer want or need, or showcase your talents, skills and services! Donations may be tax-deductible as a business expense. HOW TO DONATE Donating to WSRA’s auction is easy—simply go to www.wsra.net to fill out our online auction donation form or download a printable version. WSRA is a 501(c)(6) nonprofit. Contributions or gifts to WSRA are not tax deductible as charitable contributions on federal tax returns, however, they may be tax deductible as ordinary and necessary business expenses. Awards Gala Banquet at the 36th Annual WSRA Conference & Trade Show in Wenatchee Recyclers of the Year and Recycling Hall of Fame inductees are chosen by a panel of WSRA members, board members, and Hall of Fame inductees. Strategic Materials processes recycled glass for use in a wide array of products, creating efficiencies for our customers while conserving earth’s natural resources. Glass collected at the curbside is usually commingled, meaning that different colors and types of glass are collected together. Although all glass is made of silica and soda, the type and quantity vary slightly with different types of glass. Different melting points and chemical incompatibility make it important to sort glass by type. Strategic Materials finely tuned production processes use a series of equipment to process the various types of inbound glass material to meet and exceed our customer specifications. UW Recycling oversees UW’s comprehensive Recycling & Solid Waste Management Plan, which includes waste reduction, collection and disposal. Additionally, UW Recycling facilitates administrative oversight of the University’s contracted recycling and solid waste vendors and coordinates outreach efforts tailored to educate the campus community about recycling opportunities and services, such as our comprehensive student move out programs, MiniMax, Husky Football Bluebag Outreach, RecycleMania and more!. “Go to your people” is the motto driving the City of Federal Way’s efforts to provide waste reduction and recycling education to over 90,000 residents,150 multi-family complexes, and 1,000 local business. City staff fosters community relationships to bring recycling and waste reduction messaging directly to our constituents. Highlights include community events like the Family Green Fest and monthly Green Living workshops, “in-thefield” contamination prevention feedback at residents’ doors, as well as partnering with local community and business groups to leverage our messaging. Most recently, City staff organized a team of community members to launch South King County’s first tool library, which is on target to open this summer. The Garbology Action Project high school internship provides students with a framework to understand the complexity of the recycling system and product design as a whole – from resource extraction to remanufacture, along with the tools needed to effect change with many of the system’s influencers. As part of this program, students learn about garbology, life cycle analysis, systems theory, Community Based Social Marketing program design and how to provide technical assistance for campus-based waste prevention and recycling collection systems. They completed a full waste characterization and furthermore used their findings to develop waste reduction recommendations. The internship cumulated at a public presentation in front of Principal Hedin of Alcott Elementary, Principal Cindy Duenas of Tesla STEM High school, Mary Evans, Area Director of Public Sector Solutions at Waste Management, and other teachers and parents to present their findings. The real success of this program is the way that these students took ownership of their education and applied what they learned to a real world situation..
Tom Watson founded and manages King County’s EcoConsumer public outreach program, which provides tools and resources for waste prevention, recycling and everything “green.” The latest EcoConsumer project is the free community repair program in south King County. Watson has done more than 130 regular KOMO4 TV segments and more than 200 public presentations. He also manages the popular EcoConsumer Twitter feed, and wrote the EcoConsumer column in the Seattle Times for ten years. Local mom Regan Wong found a creative way to repurpose the contents of that long forgotten box, tucked away in a closet, filled to the brim with broken, sometimes wrapperless crayons. Wacky Crayons takes used crayons, melts them down and, using food-grade molds, crafts new, multicolored drawing tools in various shapes and sizes. Wacky Crayons was born about five years ago, when after a typical craft project of melting crayons in a muffin tin Wong’s son saw a snowman mold and wanted to try melting crayons into that shape. Her younger daughter then drew a simple coloring book and that Christmas Wacky Crayons became a business of taking recycled crayons and converting them into as many shapes as they could find. Her older children, both Liberty High School graduates, help with marketing and creating custom coloring books. The younger two, students at Maywood Middle School, get their hands dirty in helping craft the crayons. Elementary schools in the Renton school district donate crayons to Wong. Crayons are sorted and if they are not used in the production of Wacky Crayons they are distributed to other charities such as Generation Joy, which supplies art supplies to children in Africa. Recology CleanScapes collects crayons, as well, and sells Wacky Crayons at their retail stores in Bothell, Burien, and Issaquah. All packaging of the crayons is either recyclable or biodegradable. The Washington Veterans Home was built in 1910 in Retsil (near Port Orchard) and is located on a 31-acre bluff overlooking the Sinclair Inlet of Puget Sound. Today the Veterans Home is a state-of-the-art, facility providing a “Resident Centered Care” concept that focuses resources around the individual resident. The Home serves 240 residents needing skilled-nursing care. Several years ago Theresa Stanton Grose, the Dietary Services Manager worked with local recycling hauler, New Day Recycling and set up comingled recycling collection and then implemented a facility wide food waste recycling effort. The facility and its leadership has displayed significant commitment, resources and perseverance in order to implement these programs as well as to properly educate staff and residents. Theresa and the entire team at Washington Veterans home are fully committed to and passionate about diverting material from the landfill. Reuse Steve Kopa, NW Tub Co. & Across the Street Antiques Steve Kopa, owner of NW Tub Company & Across the Street Antiques shows the power of one person. He is one person from a small Southwest Washington city, but he has made a big impact of the earth, and its environment. In his 18 years in business, he has diverted at least 9,000 doors; 4,500 claw foot tubs; 1,800 porcelain sinks; and 36,000 windows, plus numerous other old building materials and unique gems from local landfills. He and a partner now specialize in creating garden sheds made completely from reused treasures. All tallied, these reused items have kept more than 5,400 tons from being buried forever. He sees beauty in junk and the possibilities of soon-to-be trashed debris. He shares his passion with others. Steve visited the Central Transfer Station in Centralia one day, and complained to Lewis County’s recycling coordinator that too much good material was being thrown away. They brainstormed, and came up with The Re-Use Center, where customers can drop off good, reusable items in the transfer station’s recycling center. Others can stop by and take the items for free. As we all know in County government, this concept wasn’t approved overnight, but it FINALLY got the thumbs up and diverts at least 2 tons per month from the landfill. Husband and wife team Tyler and Jessica Russell started Tumbleweed Bead Co. in 2002. They use only recycled metals featuring natural stones. All the ecofabulous pieces are handcrafted in the United States in their studio space in Wenatchee, WA. Since starting Tumbleweed in 2002, Tyler and Jessica have expanded and now have their own storefront, online presence, and products in boutiques around the state. Because all materials used are recycled, the jewelry Tumbleweed creates help reduce waste, while telling the story of the value of recycled products. Customers are consistently surprised and the jewelry creates a great learning opportunity for adults and children alike. Stan’s Merry Mart, an ACE Hardware store, has been in business for 69 years and is located in the City of Wenatchee (Chelan County.) Stan’s Merry Mart is the only collector of mercury-containing lamps for the LightRecycle program for a service area of 60,000 people in South Chelan County and over 20,000 people in East Wenatchee in Douglas County. Stan’s has been collecting lamps since January 1, 2015, the day the LightRecycle program began operating. They collect both CFLs and tubes and average 380 lbs. of lamps a month from customers in an effort to keep mercury, a toxic metal, out of the environment. Stan’s Merry Mart got into the program because they want to be the company that the Community can count on. Their approach to all aspects of their work is “why can’t we help people?” and that is the basis of their operations and thus their success. Terri Thomas has been working in the solid waste industry for over twenty years, starting with the US Naval Station in Crete, Greece as an Environmental Protection Assistant. Terri worked on federal environmental protection programs, and education efforts to increase recycling and waste conservation. In addition, she worked on hazardous waste disposal, inspections and coordination of HAZMAT emergency response teams. Landing next in Ventura County, California, Terri began her work in county solid waste departments acting as an Environmental Resource Analyst. Implementing waste reduction programs in both the residential and business sectors, Terri also wrote weekly “Eye on the Environment” column for Ventura County Star newspaper. Continuing her waste reduction career, Terri began working with Thurston County, Washington in 2006 as their Waste Reduction Supervisor. Leading a team of six amazing Waste Reduction Specialists, Terri worked on facilitating and promoting the addition of food waste to the Thurston County organics stream, the facilitation of the Food2Flowers and Food Recovery programs as well as establishing single stream recycling across the county. In addition, she designed and promoted the WhereDoITakeMy.org database and implemented Thurston County Sustainability Policy. As of March 2016, Terri decided to pack it all up in a reusable bag and retire. She plans on using the extra time during her retirement to camp, garden, travel, run, foster bulldogs, volunteer at the local dog shelter, enjoy morning coffee on the deck with her husband and take an occasional nap. As the education/outreach coordinator for Kitsap County Public Works, Solid Waste, Terri brought recycling, waste reduction, and hazardous waste programs to all levels of residents—preschool through seniors. During her tenure at Kitsap County, the department developed high visibility displays and literature about the collection system, landscaping, composting, and worm bin techniques, hazardous waste and green cleaning, and recycling and waste reduction. Her work on the South Kitsap School District Board of Directors gave her a great insight into emerging curricular changes which led to the development of lesson plans aligned to Washington State learning standards. To further support classroom efforts, she was instrumental in developing SEEK (Sharing Environmental Education Knowledge) which brought together all areas of Public Works as well as the PUD, City staff, water districts, and other local environmental groups to coordinate and publicize free opportunities such as a lending library for teachers, local field trips, hand on activities, and presentations to give residents a better understanding of the consequences of their actions and the solid waste system. Terri also served as the Washington State coordinator for America Recycles Day working with businesses and statewide local coordinators to highlight recycling and waste reduction to state and local lawmakers. After 15 years of involvement in local and state educational efforts, Terri retired in 2005 and relocated to Las Vegas, NV to be close to her granddaughters. Jim Wavada is a retired environmental planner who was with the Spokane office of the Washington State Department of Ecology until his retirement on March 1, 2016. Jim started his work with Ecology in 1990. Over a career of 28 years, Jim organized, facilitated or contributed to many projects designed to encourage sustainable values and behaviors in local governments and businesses operating in Eastern Washington. Recycling was a key element in nearly all of these projects. In his work with local governments, Wavada organized two summit meetings of local governments in Eastern Washington to address the unique recycling challenges of Washington state’s more remote rural communities. Jim also served on Ecology’s internal Sustainability Team from its inception and worked with that team to identify and promote opportunities to encourage more recycling of more materials within Ecology. Jim is a Spokane native and a two-time graduate of Eastern Washington University with a dual BA in Journalism and Political Science and a Master’s Degree in Public Administration with a special emphasis on Public Finance. He is a Certified Sustainable Building Advisor and worked to create comprehensive trainings in sustainable design and construction that are now used by hundreds of designers and builders in the Spokane area now know how to design recycling into their construction projects and building operations. Jim also helped establish the Inland Chapter of the Northwest EcoBuilding Guild, and has served on the organization’s board of directors. Now, Jim can be reached at any of the hundreds of great places to fish or golf in the Pacific Northwest. It might be hit and miss. You know how retired people are. They sometimes forget to wear a watch or carry a cell phone. The Report First WRED Event of 2016 Tackles “The Big Stuff” Anne Piacentino, Events and Communications Coordinator, WSRA, apiacentino@wsra.net On Thursday March 24, WSRA kicked off the 2016 WRED season with a fascinating look at “The Big Stuff” by diving into the worlds of carpet and mattress recycling. Over 70 people joined us at Murrey’s Disposal in Fife, WA to hear from experts and innovators in the realms of carpet and mattress recycling. Mark Gingrich with Murrey’s Disposal kicked off the day—welcoming the crowd and giving his insight of on the interface between customers wanting to recycle carpet and mattresses and the partners who do the work. Next, Alli Kingfisher (Washington Department of Ecology and WSRA board member) gave a brief history of carpet recycling here in WA and the west coast. Longtime WSRA member and recycling innovator, Terry Gillis (Recovery 1 and Carpet Processing and Recycling LLC) took the audience through the journey of engineering the ground breaking equipment that is the basis of his carpet processing facility in Tacoma. Through trial and some error, Carpet Processing and Recycling is almost fully operational. After hearing Terry talk about this journey, one audience member said “This guy is incredible!” WSRA agrees! Brent Erickson (Mohawk Group) spoke about the manufacturing side of the carpet industry. He gave the audience insight into the sustainability and recycling practices of Mohawk. The carpet recycling presenters then answered audience questions and we headed into a break where attendees indulged in some refreshments and networking. diverted from landfills and reused. Spring Back Recycling received a WSRA Recycler of the Year Award in 2015 for Innovation and our attendees got to see this work first hand. Next was the mattress portion of the day. Alex Erzen (King County Solid Waste) got us started. He went into the recent history of mattress recycling in the United States as well as the work being done in Washington. Alex also highlighted producer responsibility programs as well as disposal bans in different states and in British Columbia. He also gave a picture of what is coming. on a national level and here in the Puget Sound area. Attendees enjoyed lunch and more networking time with the speakers and other attendees. The group then toured both Carpet Processing and Recycling, LLC and NW Furniture Bank to see the hard work and innovation. Jeremy showed the group how the income from their retail space (Hope Furnishings) supports the NW Furniture Bank and Spring Bank Mattress. United Recycling & Container has been serving the Snohomish and King County communities for 20 years. The operation began as a recycling center, processing brush, dirt, clean wood and concrete. Join the Member Connections Committee! Formerly known as the Networking and Fun committee, this revamped group will link the association together by engaging new members and first time event attendees into the full network of WSRA. This group will establish ways in which longstanding members can connect with each other at events and throughout the year, utilizing what WSRA has to offer! Contact WSRA’s Event and Communications Coordinator, Anne Piacentino, for more information and to join! donated through reuse organizations like Goodwill, InterConnection, Salvation Army, St. Vincent de Paul, and others. E-Cycle was Washington’s first statewide product stewardship program and it has proven that a collaboration between industry and government to manage consumer products at their end-of-life does work. At less than 27 cents per pound, the E-Cycle program is both efficient and effective. Manufacturers are required by law to fund the program, while the state and local governments promote it, educate the public, and help consumers find the nearest free drop-off site are in their area— there are 350 statewide. Despite the continuing success of E-Cycle Washington, Kuntz predicts the program’s growth will slow in the coming years, at least as measured by weight. That’s because so many of obsolete TVs with massive glass picture tubes and heavy pressboard frames have already taken their final journey to the recycling center. Newer TVs and computer monitors usually feature much lighter LED or LCD technology. fluorescent bulbs release mercury vapor into the atmosphere, leading to environmental contamination and putting people at risk of toxic exposure. The best way to safely dispose of mercurycontaining lights is to bring them to one of 285 LightRecycle drop-off sites across the state where individuals and small businesses can recycle up to 10 mercury-containing lights per day. Of those sites, 217 take all types of lights accepted through the program. The other 68 locations take CFLs only. LightRecycle works with the Washington Department of Ecology, which administers the Mercury Lights Law. Go to LightRecycle.org for details. 1-800-RECYCLE Now Answering Recycling Questions in 240 Different Languages Kirsten Miller, 1-800-RECYCLE Hotline Lead, 1800recycle@ecy.wa.gov The Washington State Department of Ecology’s 1-800-RECYCLE hotline answers more than 4,000 calls a year, helping people recycle everything from aluminum cans to scuba tanks. As of January 2016, 1-800-RECYCLE can now answer those questions in more than 240 different languages. protect our State’s environment. Washington State has one of the largest and fastestgrowing populations of limited-English speakers in the United States. In 2013, the U.S. Census indicated that almost 1 out of 10 people in Washington has limited English proficiency. No, our three-person hotline team did not collectively learn 240 languages over the past few months. Instead, we gained access to CTS LanguageLink, an on-demand phone interpretation service. Improving language access on the 1-800-RECYCLE Hotline increases the ability to effectively communicate with the public. No matter what language you speak, we are here to answer your recycling questions! Now, when a customer calls the hotline speaking a language other than English, the operators simply join the conversation with a live LanguageLink interpreter. This process only adds a few extra moments to the customer’s hold time, and provides an in-language experience, as well as access to the information in Washington’s recycling database. 1-800-RECYCLE Hotline The 1-800-RECYCLE (1-800-732-9253) hotline has operated since 1976 as a free service that helps Washington residents find the appropriate place to recycle just about anything. The phone team averages nearly 400 calls a month, while another 6,000 people find answers using the online database at 1800RECYCLE.wa.gov. message on Facebook, and the staff will get back to you the next business day! In addition to answering recycling questions, the 1-800-RECYCLE team connects with local governments, businesses, and the public to ensure the Hotline is up-to-date with the latest information about new collection sites, or new materials being accepted for recycling. We work hard to keep the database current, checking on every facility via the web or through an email or phone call at least once a year. If you know of a new facility or an existing facility accepting new materials, or if you would like to see something posted on the 1-800-RECYCLE Facebook page, please email 1800recycle@ecy.wa.gov. The Report Not Horsing Around—Issaquah Railroad Mats Find New Use Elizabeth Szorad, Waste Zero Specialist, Recology CleanScapes, eszorad@recology.com As communities in King County work together to achieve waste diversion goals, sometimes unexpected partnerships are formed in response to unique situations. In early 2014, the City of Issaquah reached out to Recology CleanScapes to investigate possibilities for reuse of more than 30 yards of heavy-duty rubber railroad mats the City was replacing along historic Front Street. After several attempts to find a home for the mats, Recology CleanScapes contacted Bonnie Morris, owner of the Morris Shadow Mountain Stables in Auburn. conditions helped illustrate the benefit of the new railroad mat pathways. Bonnie strategically positioned the mats to cover sunken areas, where large puddles of mud and debris had previously existed. Whereas in the past horses had trotted through the puddles, tracking mud and moisture back into the stable, now the area was noticeably clean and dry. Bonnie even asked the City of Issaquah if they had any more used mats to complete the other entrances to the stable! Recology CleanScapes’ Quinn Apuzzo and Lizzy Szorad test out the heavy-duty mats installed at one of the entrances to Morris Shadow Mountain Stables. Bonnie’s waste zero approach to procurement at her stables is evident throughout the property. From old tractor tires transformed into animal feeders to conveyor belts used to line the stable floors, Bonnie consistently prioritizes the use of recycled material on her farm. She works with another local business to prevent hay and grains unfit for baling from ending up in the landfill. Recology CleanScapes Waste Zero Team and City of Issaquah Staff tour Morris Shadow Mountain Stables with owner, Bonnie Morris. Morris Shadow Mountain Stables is a prime example of the power of creativity, ingenuity and collaboration to achieve meaningful waste diversion. Bonnie’s story is a reminder to continue to reimagine new life for undesired or undervalued materials, and build partnerships with local businesses, communities and governments to find innovative ways to reduce waste. The Report Clark County Citizens Pledge to Become WasteBusters Zea Luce, Environmental Programs Technician, Clark County Solid Waste and Environmental Outreach , zea.luce@clark.wa.gov Clark County’s Solid Waste and Environmental Outreach team implemented a new online pledge in February, aiming to encourage waste reducing habits. Residents were able to sign up starting in January and the WasteBusters Pledge ran from February 9th to the 29th, as some say it takes a minimum of 21 days for a new habit to form. Whether myth or truth, most would agree that the time frame is short enough to stick with and be inspired, yet potentially long enough that it just might work. The goal was for it to become normal, to become an everyday habit. Participants chose one of three waste-busting actions: •	I pledge to bring and use reusable bags when I shop •	I pledge to bring and use a reusable beverage container for my “to go” drinks •	I pledge to designate one day a week to eat leftovers As wasted food is such a hot topic these days and at least 20% of Clark County’s waste stream is uneaten food, the pledge integrated food waste reduction messaging. Using the Food: Too Good to Waste framework, an informative page was launched on the website to offer tips for reducing wasted food in the home. Over the three week period, participants were prompted to write short blog posts on their progress, making them eligible for waste-busting themed prizes. The pledge was advertised in various ways, including as an insert in the waste bill and via social media, including Nextdoor (which was highly successful). to better address recycling challenges at multifamily properties and will help properties reach closer to the ideal 1:1 garbage/recycling ratio”. The goal is not to just change service or force a fit where it’s not appropriate; rather the change in code establishes a standard for properties to work toward. Full ordinance details are available in KMC 16.08.012 (G). Member Milestones Helen Freilich Moving on to a New Bend in the River! Helen Freilich left the City of Port Angeles in February after almost 12 years as the Waste Reduction Specialist. The City manages most of the waste in Clallam County, so Helen’s duties took her from Neah Bay to Sequim, where she worked closely with both public agencies and private companies to make sure recycling services ran smoothly. Helen is especially proud to have been part of a small team that converted the city recycling collection to single stream collection, closed a landfill, opened a transfer station and hazardous waste facility, and started selling biosolid compost. With the help of Coordinated Prevention Grant funding, she started a backyard compost education program, conducted waste audits with college interns, and was a principle contributor to the 2006 and 2014 Clallam County Comprehensive Solid Waste Plan updates. Her work in marketing compost was featured in the August 2015 issue of Biocycle. Helen attended many WSRA events over the years and in 2014 helped organize a WRED event in Port Angeles. “It was a long drive to most events but all the information I gathered and contacts I made were invaluable”. The WSRA Board of Directors, staff, and newsletter committee send their warmest appreciation for all of the work Helen has put into the WSRA Report over the years. Helen participated in editing and layout review, always with valuable attention to detail, creative thin king, and enthusiasm! Helen studied recycling programs in New York State for her 1982 master’s thesis. “When my family moved to Port Angeles, I was so lucky to finally get a job a job in recycling, even if it was 20 years later!” Previously she was an interpreter and planner for the National Park Service and USDA Forest Service. Helen’s husband Jerry recently retired from Olympic National Park and they decided to relocate to Bend, Oregon. They have lived all over the United States but particularly like the high desert climate. “Our kids grew up the Pacific Northwest and have chosen to go to school and work here, but we won’t be far away in the Desert Northwest!” Helen is not retiring and is looking for ways to contribute her skills and energy in Bend. We wish her the very best! You can stay in touch with Helen via LinkedIn or her personal email, hfreilich@olypen.com. The Report Thank You Precious Metal Partners!